A key committee of the Chicago Teachers Union voted Wednesday to go on a one-day strike for an April 1 "Day of Action." The union&apos;s House of Delegates were meeting Wednesday night at the International Operating Engineers Hall, 2260 S. Grove St.
ARMOUR SQUARE — Teachers will be walking off the job April 1 for a "day of action" the Chicago Teachers Union said it hopes will help pressure the city and state to properly fund the school system. After months of threatening the action, the union's House of Delegates took the vote during a meeting Wednesday night at the International Operating Engineers Hall, 2260 S. Grove St. 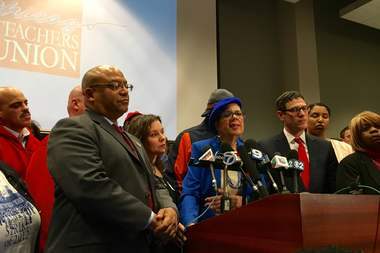 The union voted to authorize the strike with 486 votes, said union President Karen Lewis. Another 124 members voted against the day of action, but only because they thought an official strike should be organized immediately, Lewis said. "The labor conditions have gotten to a point where they are not tolerable," Lewis said at a news conference after the vote. Whereas the union has traditionally clashed with Mayor Rahm Emanuel over issues of funding and school closures, this time the teachers are putting Gov. Bruce Rauner within their crosshairs. The action is needed because the budget impasse and political stalemate in the General Assembly have led to unfair working conditions for teachers in Chicago Public Schools. The lack of a state budget has placed tremendous financial burden on the school system. Teachers already have been asked to take three furlough days so the district can save $30 million, with the first furlough day scheduled for Friday. "We are dying the death by 1,000 cuts," Lewis said. "We cannot go on like this ... We need Gov. Rauner to get a budget passed." CPS CEO Forrest Claypool said that students would be better served if the union and the district formed a united front against Rauner. He said CPS will be help families make day care arrangements for April 1. "We're particularly disappointed that the CTU leadership has given Gov. Rauner more ammunition in his misguided attempt to bankrupt and take over Chicago Public Schools," a statement from Claypool said. Johnae Strong is a CTU member but not a teacher. She said the school closures, budget cuts and political stalemate have hurt minority kids the most. "Black and brown children on the South and West sides are bearing the brunt of this trauma," she said. "It is time for Gov. Rauner to be held accountable and put money where the community needs it." The action comes after Lewis had left Chicago Public Schools officials and parents flummoxed and confounded by what was planned — whether it would be a "showdown" or simply an orchestrated effort to "shut it down" on April 1. At one point it even appeared the union was calling for a general strike by asking other Chicago residents to skip work. The union issued a news release Tuesday saying it's "part of a larger coalition of labor, student groups, community-based organizations and activists who have vowed to 'shut down' Chicago’s 'business as usual' politics by staging a variety of nonviolent actions throughout the city." Other educators throughout the state will be standing in solidarity with Chicago teachers on April 1, said Dan Montgomery, president of the Illinois Federation of Teachers. He said the action is needed because education throughout the state is in a crisis due to the lack of a budget. Staff at Chicago State University and Eastern Illinois University have already received layoff notices for this year due to their institutions running out of operating funds. As CPS and the union continue to pursue talks on a new contract, relations between the two sides have been strained since Claypool threatened 5,000 layoffs late last year, at which point the union told teachers to start saving for a strike. The union rejected a deal offer in February, immediately followed by CPS declaring $100 million in school cuts, which the union called an "act of war." The union and CPS are set to meet for another round of contract negotiations Thursday, Lewis said. The district has not yet followed through on threats to force teachers to pay a 7 percent pension contribution it has previously picked up — a cut in take-home pay teachers said would be a violation of the contract they're now working under. Union members are not allowed to authorize a full-scale strike due to state statutes that require a fact-finding mission to be completed before such action, Lewis said. The fact-finding is ongoing, she said. Because of that, CPS has declared that any walkout before the fact-finding would be "illegal." The union disagrees, Lewis said. "We have our lawyers, and they have theirs," she said.